Last week, my friend and fellow urban explorer ‘Slim Jim’ called me up, extremely excited by an amazing coincidence he’d just experienced. Like many of us who experience synchronicity, he felt compelled to share it, shout it from the rooftops – and he really wanted me to share it with the world on my blog or on the Action Squad website. So here’s the story of how another ‘synchro-skeptic’ was blasted by a coincidence that seemed ‘more than mere’ …. I am atheist, and I firmly and confidently do not believe in anything supernatural. 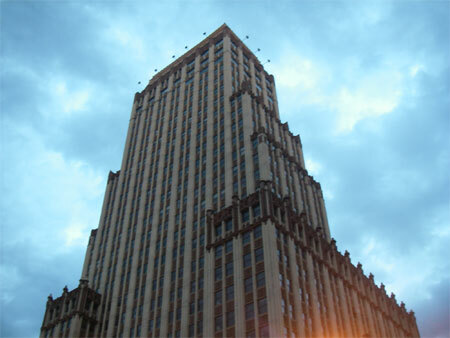 This past week (May ’09), some friends and I went down to Memphis to camp and play games in a large, amazing abandoned building. The morning we were going to leave, I had a vivid dream about snakes. In the dream, I was sitting in the middle of the woods. I’m not sure why I was there. Dreams often don’t make sense. There may not have been a reason. Right next to me was a pile of dead branches. After a while, several snakes came out of the underbrush without warning and slithered around me really fast. They were so close to me that they almost touched me. The snakes were about three feet long and an inch in diameter, not particularly large but not particularly small. Up until that day, I knew very little about snakes, and I basically assumed that most snakes were poisonous. The fact that the snakes were so close to me and I thought they could kill me with one bite scared me to the point that I sat up in bed and was jolted awake. They also were slithering so fast that I didn’t think I could outrun them, particularly when trying to run through the underbrush, which added to the scare. I rarely have really scary dreams, and I can’t remember the last time that I was awakened by a bad dream. It almost never happens. And I’m sure this is the first time I’ve ever sat up in bed as I’m waking up from a bad dream. I was really scared. And snakes, of all things! Rationally, I never really consider wildlife a threat, because it’s very rare to hear of someone getting killed or seriously injured by a wild animal. And I’m no more interested in snakes nor scared of snakes than the average person. 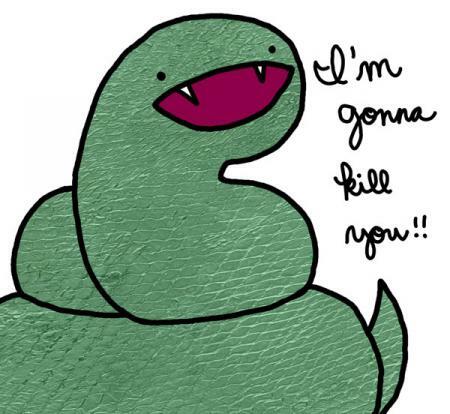 This is quite possibly the first time I’ve ever had a dream about snakes. After realizing that I was sleeping in an abandoned building, in an urban area, a very unlikely place to see snakes, I shrugged off the dream, relaxed, and tried to get back to sleep. I wasn’t able to get back to sleep, which isn’t unusual – I have sleeping problems. Shortly thereafter, Mario and I got up and left town. Our plan was to instead visit a rural wooded area at the southern tip of Illinois which has many underground silica mines. I had explored some of them in years past, but recently found out where a couple more were that I was previously unaware of. Our first goal was the Rhymer Mine. We first tried to access the mine from the road where the road intersects the valley that the mine is located on, called You-Be Hollow. There was, however, a no trespassing sign at the entrance to the valley, and since there was a house nearby and we didn’t want to get caught trespassing, we parked about half a mile down the road close to some state forest land signs, clearly state forest land. The region was about half state forest land, half private land, but there was no way of telling from the map which was which. From the road, we hiked across a long field, which had so much poison ivy that it was impossible to walk without brushing against and stepping on poison ivy pretty much constantly … This area has the worst case of poison ivy that I’ve ever seen, and I’ve wandered through woods all over the country. We followed the top of the ridge straight to the Rhymer Mine. Our trek was uneventful, except for the poison ivy that was everywhere we stepped. We found the mine right away – we found ourselves on top of a semicircular cliff with a row of mine entrances at the bottom of it. After a satisfying exploration of the mine, we set off on the mile-long trek through the woods back to the car. A short distance farther, we were walking along at a brisk pace, trying to get back to the car as quickly as possible so we could catch up with the rest of the group as they arrived in the Chicago/Milwaukee area. I wasn’t really paying attention to where I was stepping. Soon I heard a buzzing noise that sounded like an animal, but I neither knew nor cared what it was. I was too intent on moving quickly to want to figure it out. I was moving so quickly that I didn’t notice the enormous rattlesnake coiled up in the middle of the ridge until I was no more than five feet from it! This guy was huge! It was curled up in a circle about two feet in diameter. It must have been at least ten feet long. The snake itself was about 5-6 inches in diameter. Colored yellow and greenish. I think it’s been years since I’ve panicked this badly. My first thought was that it was so huge that it would squeeze me to death. My second thought was that I had no idea how poisonous this snake was, but being ignorant on snakes, I thought it was quite possible that its poison would kill me very quickly. And, knowing that rattlesnakes are dangerous, I assumed that it would have a strong desire to chase me down and bite or squeeze me to death. I ran as fast as I could back the way we came. Mario looked at me bewildered. I continued to gesture at him to run away as quickly as he could, but he didn’t seem to care. Eventually, Mario followed me, but at a much slower pace. I assumed a snake could outrun me, so I took off within a second after spotting it, so that I had the longest head start I could get before it would decide to slither after me. Keep in mind that I have never encountered a large snake in the wild before. I spent my childhood roaming the woods, and I regularly wander through the woods all over the country, mostly geocaching, sometimes hiking, and sometimes scouting underground mines. I knew there were snakes in the south, and yes we were at the southern tip of Illinois, which is relatively far south, but I thought you’d have to go down to Louisiana or Mississippi or Alabama to see dangerous snakes. The woods we were in looked like any generic patch of hilly woods I’ve wandered through all over the Midwest. It looked like the woods I grew up wandering through in Iowa. I would never expect to see a large snake in generic Midwestern woods, and even after being startled awake by snakes in the vivid dream, if I had thought about it, I would’ve written it off as an irrational fear from a dream and I would’ve never imagined that I would encounter a large rattlesnake that same day. And I’m fairly certain this is the largest snake I’ve ever seen in my life. I’ve seen a few snakes at the zoo, but none of them were as large as this rattler. I had only seen snakes in the wild on a few occasions, and the longest was about three feet long and an inch in diameter, about the same size as the snakes in my dream. This makes it even harder to believe that I stumbled upon this giant only a few hours after waking up from a dream about snakes. This hike back to the car was like an obstacle course, changing direction multiple times to avoid tractors, people, turkeys that we thought were people, lakes, and, most notably, snakes. I hike off-trail in the woods quite regularly, often sneaking around on private land, and I’ve never experienced anything this weird before. My 29th birthday is today. I’m getting old. But this is the first time I’ve ever sat up in bed as I woke up from a bad dream, and I can’t remember the last time I woke up because of a bad dream. It’s very rare. I’ve also never seen a large snake in the wild before. The dream happening by itself would not be noteworthy. Seeing the huge snake in the wild was pretty shocking, and is a rare occurrence, but it does happen. But what are the odds of sitting up in my sleep from a dream about snakes and no more than six hours later finding myself five feet from a huge rattlesnake in real life? Unbelievable. Part of my brain refuses to believe it really happened. One remarkable occurrence of synchronicity isn’t quite enough to make me believe in the supernatural – I’m inclined to chalk it up to one crazy coincidence – but it does get me thinking about it. I knew Max Action was interested in synchronicity and had had several surprising and unbelievable events happen to him. As we drove back, I called Max to tell him about my amazing incident and see if he might be willing to post it on the Action Squad site or on his blog. Believe it or not, at the moment I called, he was working on his synchronicity blog. 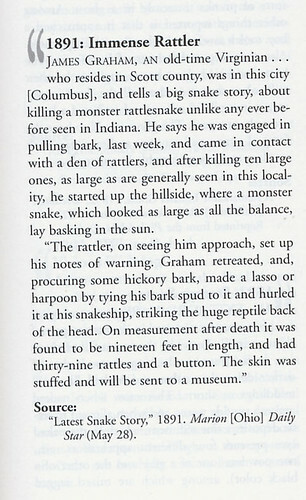 I have no reason to doubt that the snake Jim saw was indeed massive – even though it would be larger than any timber rattler known, if his estimate of its size is even close to accurate – he’s a very sober engineer type, and if his first thought was that the snake was going to actually squeeze him to death, it HAD to be huge! I wish I could remember my dreams … from Carl Jung to Slim Jim, people have amazing coincidences with their dreams – but since I never remember mine, any such synchronicities are doomed to be unnoticed and forgotten. Good thing I have plenty of waking ones, I guess! My current thought on remembering this dream – and it could change as I think about it some more – is that I remembered it because my brain knew there was a good reason to remember it so my brain made sure I remembered it. I very rarely remember my dreams, and if I remember a dream, it’s almost always the last one of the night, right before I wake up, as this one was. The rareness with which I remember my dreams makes it even more remarkable that I remembered this one so clearly. Of course, being jolted awake really helped. So, even though you don’t remember dreams, if your brain positively decides you need to know something from a dream, I’m convinced you’ll remember it when you’re awake! Not sure I’m clear, are you saying your brain knew that you would run into that snake the next day? Basically, yes. I’m not sure I even believe that was possible – I don’t know how it could be – but it makes sense as a reason I’d have such a horrific dream about snakes. Since the snake incident happened is a reason that I got so freaked out a few nights ago when I dreamed that I knew I was going to die, and I’m a little scared of going through the sequence of events leading up to my death that the dream led me through if I ever end up doing what I did in the dream. And I don’t want you to get the wrong impression that I positively believe my brain knew I was going to meet the snake. I think it’s a distinct possibility and the only explanation for the dream, but part of me that’s very rational and scientific still doesn’t believe it. Try keeping a dream journal by the bed, and thinking about remembering your dreams before you go to sleep. Sometimes that intention is really all that’s needed. Maybe part of the problem is that I stay up too late and then cling to sleep … coming out of a dream, I don’t WANT to wake up completely and write something down, I want to go back into deeper sleep! Sorry, I can’t recall any of the strange things that have happened to me. I’ve had quite a few, but I usually don’t pay them any mind or feel they’re worth remembering. Really, I just think that most of this is coincidences when similar themes happen within a short time frame, and one remembers them because of the closeness- but if anything else similar happened, yet slightly changed as to not align just perfect, you’d be just as quick to forget about it or brush it away as being normal. One person may look at a situation like this and think, wow, those two things align- maybe it means something; while another person will look at the same situation and see nothing out of the ordinary, save for the fact that the entire situation was even mentioned. A similar idea is where one religious person looks at the world and goes “wow, what an amazing place this is that god created” while another non-religious person looks at the same universe and goes “wow, what an amazing place this is that happened to form”. Both are describing the same topic, they can both be viewed from the outside as being fundamentally the same statement, and could be interchanged in common speech- but both ideas are extremely different from one another in the views of those who said them, and what they were thinking as they said them; save for the target statement in the beauty of the world. Suppose we have a subject who has never encountered both cats and dogs in their entire life- they know what they are, and have seen them at a distance, but have never personally encountered them. One night, they have a dream that they are attacked by a rabid dog. They wake up, frightened, but quite fine and unharmed. The next day, they go over to a friends house for the first time, who has a cat. While there, the cat comes up to this person, and the cat can sense uncertainty and slight fear radiating from the person, and tries to squirm away. The cat’s owner then picks up the reluctant cat and places it in our subjects arms- the cat flips out, takes a swat at the person’s face, and runs away. Our subject sees this as a connection- of all the days that she had to encounter house pets for the first time, she’s attacked, just like her dream! No mention of the fact that the two animals were different, because it’s quite the same from her perspective- while most people would never think of linking the two. More than likely, she’s had similar dreams as well, as we all have- but she’s forgotten them over time. Cool, thanks for commenting. As open-minded as you strive to be, your rationalist biases are of course showing (for example, your assumption that the forces of nature are best described as “random chaos” is a leap of faith equal to any religionist’s). I agree that there can be many ‘false positives,’ but I can’t agree that we can or should simply dismiss patterns we glimpse and intuit because they are currently inexplicable or can’t be fit into a favored paradigm. when I said ‘random chaos’ in nature, what I mean was human nature’s desire to imagine things that aren’t really there- spots that look like faces on a tree, horses and dogs in clouds, etc., for the sake that it’s natural. We’re designed to spot faces- predators and enemies in the forest I gather. I tried to write as much of that as possible in an open ended view, leaving the final thought to the reader- to quote an idea from a book, anyone who simply closes off their mind to any idea is shutting out reason. As a benchmark, would you tend to think the teapot coincidence I experienced was just a purely random fluke? i actually haven’t decided on the teapots. I keep thinking back to them since I came into this discussion, and I really can’t tip either way on what I think. I’m open to the idea of something greater, but I’ve also found it extremely difficult to believe such a thing, which is why I left my parents church. Think of me as a forced agnostic against my will, chosen atheist, but also more than willing to listen to anything anyone has to say and base my thoughts of their experiences. Example: if I happen to be watching TV, and I see a ‘ghost’ or ‘monster’ or ‘ufo’ or any other strange unusual phenomenon on, I’ll usually watch it. Not because I believe it, not because I want to refute it, but just to watch it and maybe see something that I can’t otherwise explain. That’s yet to happen. Although in my case, that faith is in “I know not what.” – I still don’t believe in any gods or metaphysical supernatural theories, I just know that reality is a lot more complex and interconnected than I’d ever given it credit for being, that time is far less real than we experience it as, and that the skull is not an impermeable barrier between mind and reality. Basically, I don’t know what the hell it’s all about, and I don’t even believe in anything supernatural – but I do think that a sufficiently complex universe can be, and is, indistinguishable from “magic,” from our limited perspectives. Thanks again for commenting, love the discussion. Hope Jim returns to join in too. I don’t know what you mean by the word faith, but just because you believe in something beyond the fundamental, rational viewpoint I’ve had for year doesn’t mean it has to be the Christian God or any specific religion. This experience has led me to think there’s a distinct possibility there’s more to the world than can be explained by rationality (my definition of the word, sorry I don’t have a better word for it) but I’m still just as adamant as I was before that the narrow-minded Christian belief system that most Americans believe in is not true. There are so many religions out there that it narrows the likelihood of any one religion to be true, and even if there is more out there, my guess is it’s probably not in the form of one God or anything religion would like you to believe it is. I do not think it’s likely that synchronicities are orchestrated by one single entity like a God. It’s probably something more subtle and involving non-religious things, sorry it’s hard to explain what I mean. And I’m not even sure I believe in that. “Dude. My connection was very, very unlikely to be random. I dreamt of snakes for the first time I can ever remember dreaming about snakes, and it’s the first time I ever remember being jolted awake by a dream and sitting up in bed. Then six hours later, I find myself five feet from the largest snake I’ve ever seen in my life, including the zoo. Locating patterns is a key element that often leads to a major discovery. Synchronicities are such a pattern and many are drawn into analyzing this phenomenon further. Jim’s scientific/rational mind is keying into a pattern, compelling him to investigate further. This brought him to recollect his story to someone who would be interested. If we have learned anything from history, it’s that many new discoveries are held back because of conflict with preconceived notions of the day. It took Darwin… what, some 40 years to come forward with his discovery on the origins of the species (it doesn’t take a rocket scientist to know the reasons why). As always, it requires great courage for the ‘Darwinian’ type of discoveries to be pursued and made… but when the discovery finds its way through, the world is turned on its ear. I think snakes can be looked at symbolically whether seen in the sleeping dream or in the waking dream or both. When I think of snakes, I think of my connection with life force energy. Sometimes I get disconnected from my base chakra and need to reconnect and integrate it into my life. If I am too much in my head and ignoring my body’s natural flow or if I am bypassing the heart chakra by disconnecting from my feelings, I will get signs from the universe pointing to this imbalance. The bigger the snake, the bigger and more dangerous the imbalance. I’ve been seeing turtles everywhere, I was even given one recently that was carved by someone who is now deceased but who lived and worked at Esalen, which is a place I had been looking into for classes. I told my sister that our grandfather reminds me of a turtle and she jumped up and left the room to come back with a turtle he had sent her! I am learning to balance water and earth, spiritual and material reality and how to live equally in both. Also, the I Ching was discovered on the back of a Tortoise shell and Tai Chi is based on the eight trigrams of the I Ching, both of which I am very involved with. If you get the chance, read Michael Talbot’s The Holographic Universe. It covers everything you two are discussing – and then some! I went on line and read a few accounts on the disaster. One thing stood out – a worker at the plant reveals that he saw a victim go by on a stretcher with his severed hand laying on top his chest. Strange… just the other day I was doing a little research on the words “two” and “Tuesday” and found that the God responsible for our #2 is the Nordic “Tyr”—portrayed with a severed hand; and/or the Germanic “Tuisto” –considered by scholars as a hermaphroditic being). Maybe these connections amount to a cryptic message… in much the same way that dreams often have parallel/ ‘double’ meaning. Some other associations having to do with snakes that come to mind are, secrets and unconscious motives. Also, there are some not very evolved people in the world who one may accidently stumble upon who may become “rattled” and “bite” if disturbed or frightened. Be aware and alert of who you encounter. You may encounter someone like that in places you wouldn’t expect. I had a strange experience; not really a dream, more of a waking vision. I took a short nap before going on an errand. I was lying on a lazy-boy type chair. I fell into a light sleep and woke shortly as I better get going. As I pulled myself upright, still with closed eyes but aware I was awake, I literally saw a picture of my car’s dash like a projection on my eyelids. What’s more, one of the warning lights was on; the alternator. I opened my eyes and shuddered because I dread car problems. I tried to shrug it off but it was too real to ignore. I left and on the freeway my car began to emit white steam. I drove to my destination refusing to believe anything was wrong and even stopped at a gas station where the guy said it might be the wet pavement hitting the engine. There were no warning lights on so I chose to believe him. I proceeded on home, steam bellowing around me. Closer to home I stopped again and was told a coolant hose was leaking–on my ALTERNATOR. I limped home and just then–bing–the alternator light went on. There is another snake story in the bible, I think it’s in Joshua but not sure, about when the Israelites were wandering in the desert and bitching and moaning about it. Apparently, God doesn’t like complainers so he sent poisonous snakes to bite them. The only cure for the poison was for them to make golden statues of snakes and gaze upon them. Maybe God was a fan of Jung. This is so thinly veiled for bringing the emotional poison and unconscious motives up into the light where you can see them. Very Kundilini and Kriya yoga as well.